A day of high drama in Holmpatrick, started well for Skerries with plenty of pressure from the home side who played with a strong wind in the first half .Against the run of play Bective scored a try from a block down, well finished by Gearoid O’Grady who also converted the try to leave the score at 7.0 to the visitors after 10 minutes. Bective lost their loose head prop injured early on and this was to have a big bearing on the match as the Skerries scrum dominated all day. Cormac Marrey , Chris Tonge and Mark Nally all having strong performances. After 22 minutes Billy Mulcahy kicked a fine penalty to reduce the score to 7 3 after a high tackle and on 30 minutes Mulcahy converted to make the half time score 7.6 in favour of the away team. The challenge for Skerries in the second half was to play into a strong wind and put pressure on the opposition and after 3 minutes, after a series of mistakes by both sides the ball made its way to Evan Sherlock who was loitering in the back line and after a strong run, fending off several tackles he scored in the corner much to the relief of the home crowd and the difficult conversation was missed .Skerries now led 11.7 The big character test for the home team now began and the pack in particular stepped up the challenge, all members of the back row Sherlock, Michael Turvey and Ross Mcauley were making the hard yards but it was the second rows Tom Mulvaney and Joe Glennon who were outstanding both in line out, scrum and huge work rate around the field. 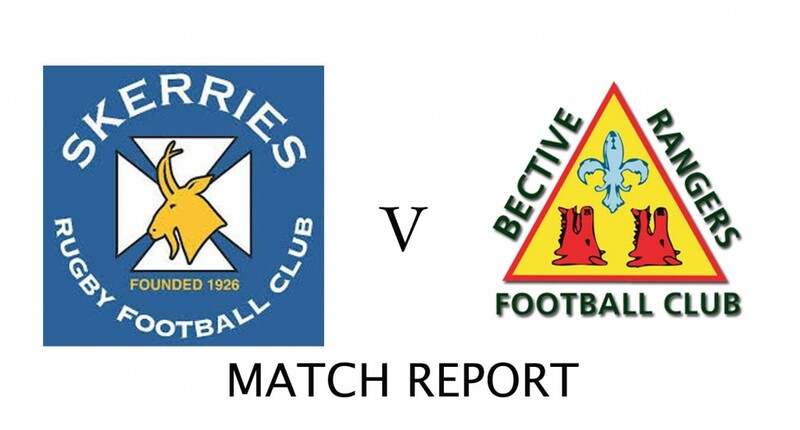 Bective had two penalty chances, one hit the post as Skerries held on tirelessly. A break for Bective after 65 minutes looked like a potential try but an excellent tackle by Paul O’Loghlen averted the danger. After an infringement by the home team Gearoid O’Grady kicked a penalty to make score 11.10 in favour of the home team. Bective had a player yellow carded after 70 minutes and the Skerries pack continued to put huge pressure on the away team. Bective missed a further penalty after 78 minutes and then much to anguish of all the Skerries supporters, the referee Gary Glennon played 6 minutes of injury time which was played at a frenetic pace as Skerries tried to hold on to this hugely important result. The sound of the final whistle brought huge relief to all players and supporters, Skerries winners by the tightest margin 11.10. Strong performance by the backs in the last 15 minutes, Colin Doyle, Barry Cauldwell, Paul Devitt, Mark Oliver and Paul Devitt, another strong performance also from scrum half Eoghan Carron got the team across the line. It has being a difficult few weeks for the players and coaching staff but they showed real character in this match and it bodes well for the second half on the season which will resume with the return match v Bective at the end of January.